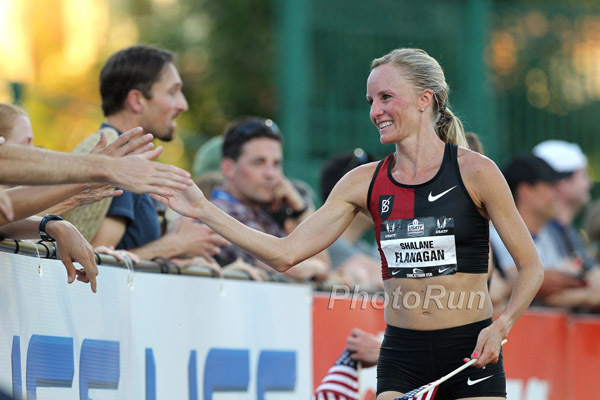 In her first race in 10 months, Shalane Flanagan was the easy winner of the 10,000 at the Portland Track Festival on Saturday. After passing halfway in 16:00, Shalane started cranking out 75-second laps to finish in 31:38.68, 29 seconds ahead of runner-up Rachel Cliff. It was a solid-and-then-some return to action for Shalane in her first race since placing sixth in the Olympic Marathon last August. Shalane suffered a slight fracture in her back over the winter and had to withdraw from the Boston Marathon. Saturday’s race came after just three weeks of workouts. In Sunday’s action at the Portland Track Festival, Lopez Lomong was third in the 1500 (3:38.52), Jess Tonn was second in the 5,000 (15:33.13) and Natalja Piliusina was seventh in the 1500 (4:11.04). Shalane will return to the track in less than two weeks for the USATF championships in Sacramento, California. She’s also slated to run the Peachtree 10K in Atlanta on July 4.